It was the year 2000. The commotion around the change of the New Year and entering a new millennium with all its discomfort and disruption had ceased. Life went on with no power failures or computer viruses eating up all data and erasing bank accounts. I would not have minded if my bank account was erased, since that would have meant no trace of outstanding debts. This was also a new beginning for me, not due to New Year’s resolutions I’d made, because I hadn’t. The airline contract I had lost three years before was handed back to me and again I was the publisher of Air ALM inflight magazine Trade Wind –the national airline company of Curaçao. Retrieving the contract was a bitter/sweet feeling, because the finance company insisted I seized the publication of my own quarterly multicultural magazine COLORS, in order to focus on Trade Wind. Only under that condition would they finance the startup cost. A small reception was held with dignitaries, steady customers and the press to celebrate this milestone. It is amazing how my paternal and maternal grandparents were born on the same Caribbean islands, except for Anegade, then moved to Santo Domingo, where they lived, worked, and got married, resulting in the birth of both parents in the Dominican Republic. Immigrating to Aruba later, as fate would have it, my parents’ paths crossed, and seven siblings, including myself, were born on Aruba. The Vanterpool’s, mamá included, love to brag about their heritage. Mamá made some remarkable statements that today would be considered racist. “Fold in your lips and pinch up your nose” mamá would tell us. A person with thick lips and a flat nose, was and still is, considered by some as ‘black and ugly,’ as opposed to thin lips and a sharp nose. Regularly, we would find mamá pinching up her sharp nose as that was and still is considered beautiful by some. I clearly remember us walking around with wooden clothes pins on our nose. 3. Curaçao, here we come! On Curaçao the natives speak ‘Papiamentu,’ and Dutch was taught at schools. In San Nicolas, where we lived, English and Dutch were spoken. Papiamentu was also spoken by the locals living in the main city of Oranjestad, but most of our family lived in other parts of San Nicolas or just outside Oranjestad. Daddy was the only one who could speak and understand Papiamentu. In the Netherlands that’s called “inburgeren.” As children learn fast, it didn’t take long for us to pick up the language, and so did mamá who spoke Spanish well. Many inmigrant women from the Caribbean worked as maids or, to use a modern term, as housekeepers. They would work hard, and from the little they earned, they saved a certain amount to send back home to help support their family and children. So did Portuguese men selling ice cream and ‘palo-friw’ in the hot sun, pushing a wheel cart with bells. They had some similarities with immigrants from the Caribbean. We all participated in youth meetings and other church activities, such as singing in the choir, acting in plays, and reciting poems in special services on Easter Sunday, Christmas, and Youth Rallies.’ Bartolo was proud to be the lead singer of the choir singing ‘He Could Have Called Ten Thousand Angels,’ accompanied by daddy on the organ, and George on the piano. Daddy was also the choir leader and mamá was a solo soprano singer. Everyone in the church was happy with the Libert’s family who were talented in music, singing, and acting. This church was similar to the one we attended in Aruba, with the majority of its members consisting of English speaking Caribbean immigrants. So we felt at home as well. As the years went by, all good things came to an end. ‘Calling Ten Thousand Angels’ was needed more than ever before to calm the storms of rage, rebellion, and youthful lust among us. As a matter of fact, the whole world was marked by the good, bad, and ugly revolution of the sixties. Industrial and technological inventions were accompanied by moral and spiritual bankruptcy of rage, rebellion, and ungodly practices, opposing and tearing down the walls of principles, morals, and values. The passing pleasures of sin seemed to be unstoppable. Finally, after all the bad news, including a miscarriage at age nineteen, I finally had good news. Yes, I was pregnant, despite the precautionary measures. On a vacation trip back to Aruba, I stayed at my cousin’s house at Lago Heights. One day we went swimming and hung out with friends. When we got home, I felt a terrible pain in my lower belly and started bleeding heavily. I had no idea what was happening. I knew I was pregnant before the trip, however it didn’t cross my mind that I was having a miscarriage. One of my cousins was a nurse and started asking me embarrassing questions. She then explained to me what was happening. The rest is history! Romance was also on the rise with courtship and wedding proposals from local and foreign men, both Christian and non-Christian. Most of the ‘brothers’ in the church were good and godly, and, of course, some were better looking than others. The ones I was attracted to were already taken. I had a reputation of stealing other girls’ boyfriends. However, I’d rather say that my personality was irresistible. Nevertheless, most of them spoke Papiamentu and broken English or Dutch, not to mention Spanish. The ‘brothers’ from abroad could at least express themselves properly in English. I’m not saying that I was the smartest kid on the block, but I spoke four languages fluently and correctly, I had a well-paid job, and a charming personality. I wanted a man who would elevate me. And speaking in Caribbean terms, “Not some poor, black, ugly, big face, flat nose, man either.” Racism and discrimination are not uncommon among some church folks. Some of these men were engaged or even married, yet longed for a ‘hot’ midnight snack! Living alone, at liberty to go and come as I wish, with no obligation to anyone, one evening I invited that significant man to my house for dinner. Instead of going to the happy hour again, we had our own ‘happy hour.’ His name was Nelson Pierre. Nelson and I were madly in love. We had chemistry and passion when we were together. Within three months since we had met, a date was set for August 28, 1987. Many of my friends were surprised at how quickly we were getting married. Some people, including my pastor, even asked if I was pregnant. Pastor Vincent was shocked and disappointed when I broke the news. His beloved friend and spiritual ‘daughter,’ who many looked up to, bluntly refused to follow the rules and regulations of pre-marital counseling installed by the church. I told my pastor that living together while unmarried was also against the rules, hence we decided to marry by civil law. Disobedience was not tolerated, and consequentially I was suspended of my tasks. 7. A Match Made in Heaven or Hell on Earth? We spent a splendid honeymoon in Costa Rica, and fell in love with the country with its cool climate, breathtaking landscape, and peaceful serenity. I clearly recalled the large, juicy chunk of fruits the hotel served when I ordered a fruit platter. We also enjoyed succulent steaks and mouthwatering sea-food dishes. It was a Tuesday night at the closure of the Carnival season when King ‘Momo’ was burned after the march. On Ash Wednesday, the day after, Catholics painted a black cross on their foreheads from the ashes of King ‘Momo,’ symbolizing the Lent season, a 40-day period of fasting and penitence leading up to Easter. My personal lent season of penitence had also started. Having lived together for one year, I started thinking and evaluating past incidents, including the first incident before we were married. It seemed like a quarterly pattern that occurred after meeting with friends and consuming alcoholic beverages. And also just before a new edition of the magazine was due to be released, which was quarterly. Alcohol seemed to lead to drugs. Why would Nelson do this to himself and to us? Was his love for drugs stronger than his love for me? Why would he prefer to spend the night with shady people in dingy places, than sleeping with me? Where did I fall short? Had I lost my spark? Time went by and Nelson was off balance again. Day and night strange people turned up at the door or called by phone saying Nelson had sent them to collect cash or a check. As fast as the money came in, it slipped through our fingers like water. That was exhausting and seemed more like a curse than a blessing! Unknown to Nelson I made an appointment with a divorce lawyer to find out how much time the procedure would take and the expenses involved. After a few days I told him and that made him furious. He promised to re-enter rehab abroad and begged for another chance. It was Tuesday, October 1st 1996. For the third time Nelson didn’t show up. My lawyer stated her case and insisted that the judge pronounced the verdict. A Dutch judge pronounced me ‘divorced.’ Finally, I was legally detached from Mr. Pierre. Within a month and days, the legislation was made official on paper. Liberty at last, however there was no reason for celebration. I was a divorced woman and mother with two toddlers to raise without the presence of a father. How was I going to handle that and maintain my standard of living? Fatigued and exhausted I drove to my parents’ home to give them the news. Neither of them were in high spirits. Divorce within a Decade was Defeat! Daddy did not sit at the piano and played triumphantly: “I know that victory shall be mine; if I hold my peace the Lord will fight my battle.” My battle was lost and so was my marriage! It was a Pyrrhic Victory! At home, I could be who I really was, without worrying that all eyes were watching me. Home for me was the place where I lived with my mother and my brother. I never really knew where my father was. I cannot remember him as a father figure, even though I knew he was my father. In my mind he was the man who every now and then disturbed the peace at home by coming around in the middle of the night knocking on the bedroom window, begging my mother for money. I knew he was doing this because he used drugs. When I turned 16, I wanted to throw a big party. On MTV there was a program called “My Sweet 16” where girls celebrating their sixteenth birthday went all the way out. Their parents rented a venue and invited as many friends possible, with dancers, DJs and, a car as a present. In the summer before my sixteenth birthday, I started making plans with my mother. Of course I knew my Sweet 16 could not be as extravagant as that of those girls on MTV, but I could give it a try. I had promised myself that if I got my High School diploma, I would go to college. My motivation was that I wanted a title to my name. I gave serious consideration to which study I wanted to follow. Ideally I wanted to follow a study in which I could help children with different problems. I ended up with Educational Sciences / Pedagogy, and I attained the degrees successfully. First a Bachelor’s followed by a Masters, which now makes me (MSc) Master of Science Belladonna Pierre. I did it! So now it is my turn to tell my story! I believe that sometimes you have to do those things you don’t feel like doing for the reason that the result might surprise you. You might then also have a nice story to pass on to others. After school we often visited my grandparents. It was the most loving and safe place for me. My grandmother always cooked for the entire family and it was a kind of walk-in house for my aunts and uncles. My grandmother often read to us from the Bible and sang Christian hymns with us like “Hallelujah Anyhow.” I’ll never forget that song! My friends and I also went disco swimming at Brandenburg swimming pool in Bilthoven. That was quite a new experience. At school everything went as usual and I remember there was a girl I really liked.. I even wrote her a love letter, the good old-fashioned way. Ultimately, on April 2nd 2015, I graduated from college and attained my Bachelors degree in Commercial Economics. I now bear the title Bachelor of Commerce, BSc. My internship was successfully completed at Learning Valley, the company where I’m now employed as an account manager. On Sunday, August 10th 2008, my children and I went to my parents’ home after church. We sat in the car and parked in the shade while we waited for my parents to get home from church. As we spoke, it was as if the location for my bed and breakfast suddenly jumped up and shouted, “Look no further, this is it!” The parental residence, along with the other two properties would be the perfect setting to realize my dream. Here was where I envisioned the bed and breakfast. There they stood, staring me in the face! It takes Grit and Guts to be and do the abnormal and extraordinary! Many locals complain of foreigners, especially the Dutch or ‘makamba,’ that come to the island and deprive them of what is theirs. 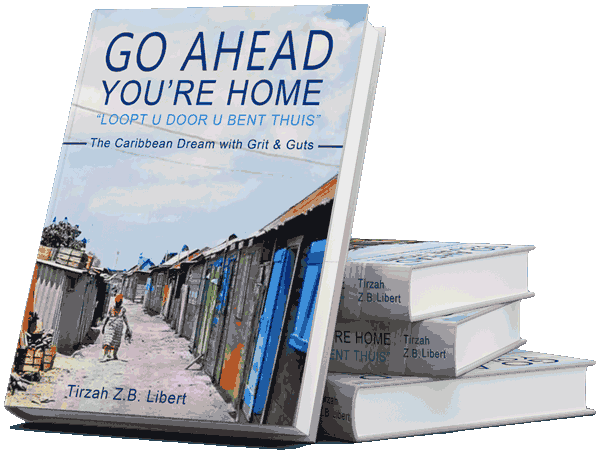 While in some cases this might be true, complaining and criticizing whether Dutch, American, African, Indian, Haitian or Dominican, who dare to stick their neck out to improve and invest in the island, will get me nowhere. By sharing my dream and vision, I choose not to sit on my assets, but Stop Complaining and Start Obtaining!